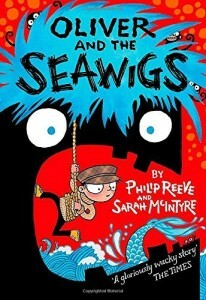 Rambling Isles, shipwrecks, sarcastic seaweed, posh hairdos and nasty villains all add to the adventure in Oliver and the Seawigs. It’s a very amusing, action packed, first chapter book that would be perfect to pack for a seaside holiday. Oliver is looking forward to starting school and a quiet life in Deepwater Bay but Mr and Mrs Crisp’s adventurous spirit throws him into a crazy, action packed adventure. The Rambling Isle with the most impressive seawig will be named the most important island for the next seven years and competition for the most impressive seawig is fierce. Oliver and his friends navigate the Sarcastic Sea to find a shipwrecked submarine for Cliff’s seawig before their first encounter with The Thurlstone who wants Cliff’s shipwreck for his own seawig. Oliver’s parents are on The Thurlstone but so is evil Stacey de Lacey and his army of sea monkeys. We don’t want to give any more of the story away but we just had to keep turning the pages to see who would win the seawigs competition and to find out what would happen to Oliver and his parents. The characters in Oliver and the Seawig’s have very distinct personalities, even the islands. Oliver is brave and has inherited his parents’ adventurous spirit, Iris is a plump, shortsighted mermaid whose terrible singing comes in very useful and Cliff is grumpy and bad tempered but proves loyal to his new friends. The Thurlstone and its captain, the arrogant, self-centred Stacey de Lacey, are definitely the villains of the piece but we do find Stacey de Lacey’s sea monkeys funny. 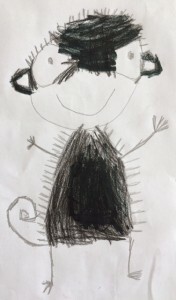 Illustrator Sarah McIntyre has instructions for drawing them on her website. 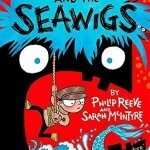 Oliver and the Seawigs is the first book that we have read on the iPad and although we still prefer reading real books we enjoyed the experience (once we got use to swiping instead of page turning!). It was great to be able to zoom in to see Sarah McIntyre’s cartoon like illustrations in more detail. My daughter was fascinated by Cliff’s seawig and pored over the pictures of the mermaids who sing on the Night of the Seawigs. I love the picture of Oliver swimming with the sea monkeys, they really are quite cute! This is a great story for children starting to enjoy chapter books and for beginner readers who are looking for a more challenging read than a picture book. Plenty of original action moves the story along at a fantastic pace and the characters’ ingenious thinking gets them out of some tight spots and brings the story to a very satisfying end.